I know it seems I've been a lazy blogger, but in my own defense I have been sick, and now have a sick teenager to care for. You think teenagers are demanding of your time and attention? Wait 'til they get sick. 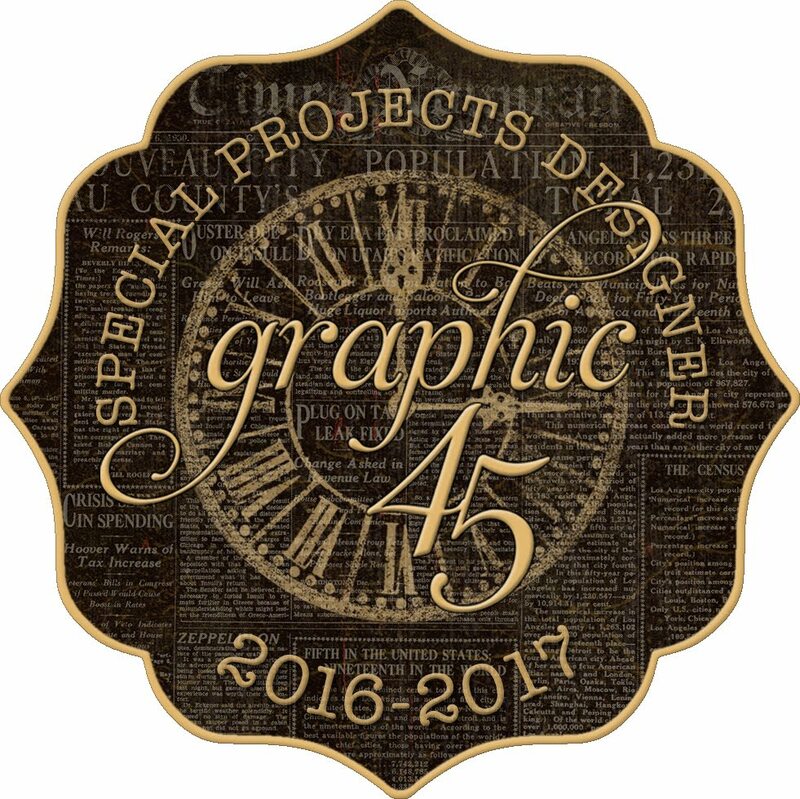 Every time I sit to create, to check e-mail, to blog,... I'm called to her aid. I'm not complaining, mind you, because now that she'll be starting high school this fall, the realization is hitting me that it won't be long before she's gone away to college. And I'll wish for her to need me the way she does now. Oh gosh, don't even get me started thinking about that. 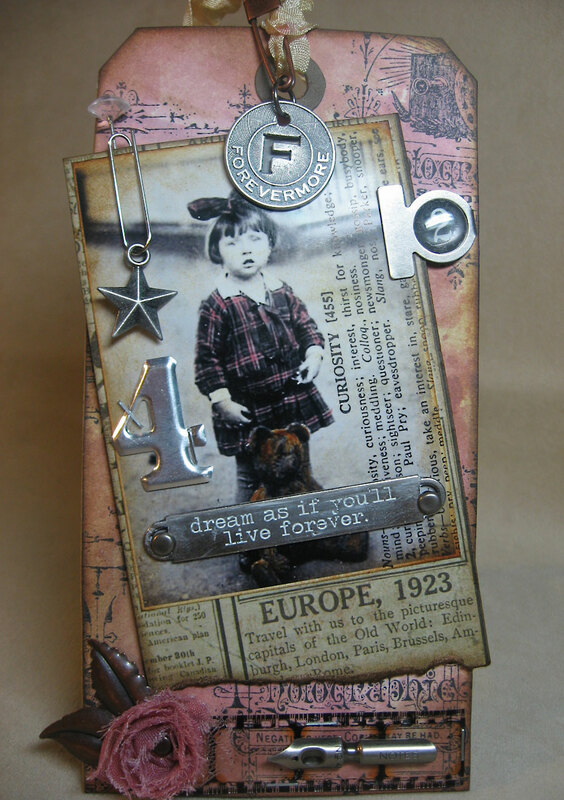 While she napped yesterday, I snuck in some creative time and made my June tag of Tim Holtz's 12 Tags of 2012. Check out Tim's tag and his step-by-step photo tutorial (and a bonus video) on his blog here. My tag is very similar to Tim's this time (usually I like to change it up quite a bit) because Tim provided us with this great vintage photo on his blog to print out and colorize. Since she was the main focus and she's so cute, I just had to use her. I made some minor changes though, like moving the film strip to the bottom of the tag as well as the pen nib. I also eliminated the tissue tape across the top right corner, but that was simply because I didn't want to cover up the vintage camera stamped in my right corner. Such a great detailed stamp. I didn't have Tattered Rose Distress Stain like Tim did, so I used Victorian Velvet therefore my pinks are a bit deeper in color, which is quite pretty too. 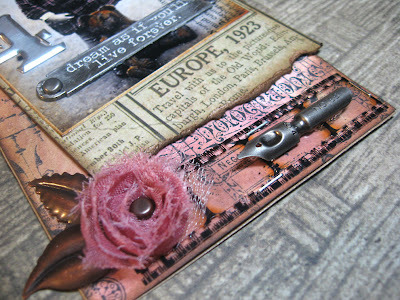 The background color of my main tag is more pink because I used only Picket Fence and Victorian Velvet stains when mixing on my craft sheet. I love how Tim has us trying something new all the time. I realized that I've never hand-tinted a photo before. Only in PhotoShop. This was surprisingly easy! Simply use a craft nib as a paintbrush, swipe it across a Distress ink pad and brush the color right onto a glossy photograph. 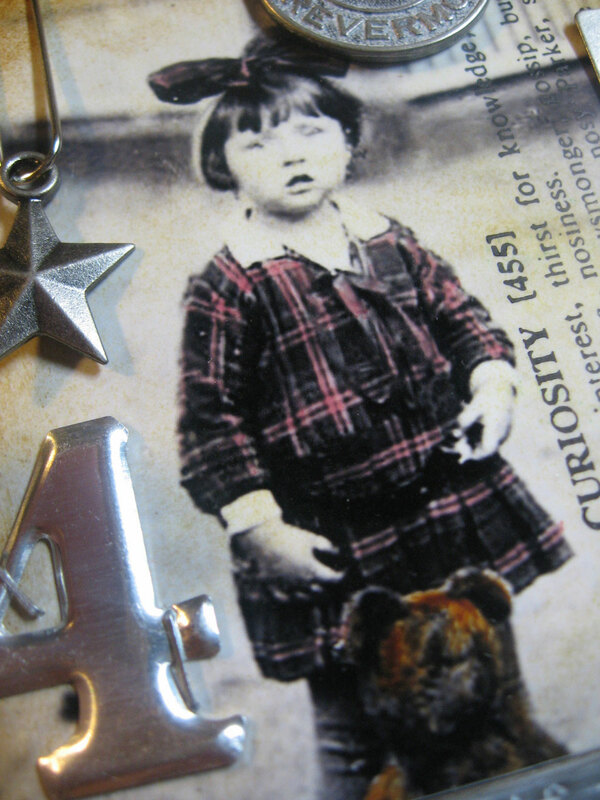 Here I used Victorian Velvet on the girl's hair bow and her plaid dress, then Vintage Photo on her teddy bear. Be sure to check out Tim's video on his blog post on how to colorize a black & white photo using this technique. Love the way your tag turned out. The pastels make it look bright.